This week for Iron Craft we were asked to sculpt something. I have taken pottery and clay classes and know there isn’t a sculptor in me, but I remember having fun making salt dough ornaments as a kid and decided to play with it again. The question was what to make. 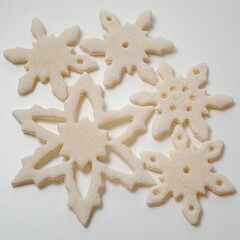 Salt dough is super easy to make and uses three ingredients you already have in your cupboard. You could make these to match whatever paper you are using or just to hang on the tree. It would be really fun to have kids make them to go on gifts for the family. Mix the flour and salt together. Stir in the water. 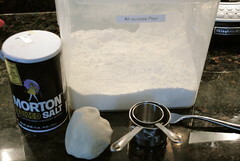 Knead until combined on a lightly floured surface. The dough should roll out without breaking but not be too moist. Add more flour or water if needed. Put in an airtight container and work with a little bit at a time so it doesn’t dry out. Use your toothpick to put a hanging hole in each ornament. 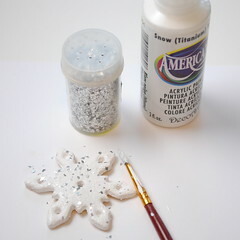 I also used it to make designs in the snowflakes. 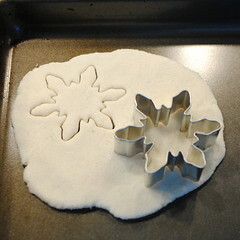 I got the baking sheet above worth of 2-inch ornaments out of half the dough. 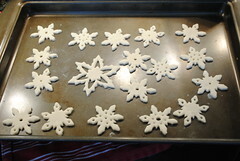 Bake for 2 hours, turning the ornaments every half an hour or so. You want them to be baked completely through. (You can also let them air dry, but that takes a couple of days. Once cooked, let the ornaments cool and decorate them. 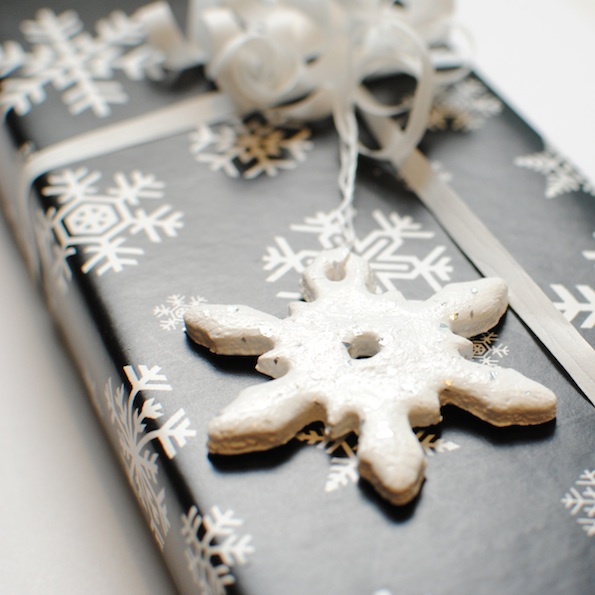 They looked pretty natural, but I wanted whiter to match my wrapping paper. I painted the ornaments with white acrylic paint, one thick coat was enough. While the paint was wet, I sprinkled on some silver glitter. After both sides were painted and dry, I painted on a coat of varnish. You don’t have to varnish them, but it gives them a nice shine and will make them last longer. 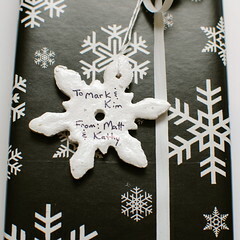 If you want to use these as gift tags you can write on the back of them with a fine point sharpie. Each year when your friends and family hang them on the tree, they’ll remember who made it for them. 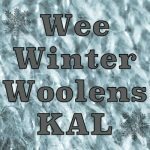 8 years ago by Kat in Challenges , Christmas , Craft Projects , Crafts , Holiday , Iron Craft , Projects | You can follow any responses to this entry through the RSS feed. You can leave a response, or trackback from your own site. Loved the idea–think I will do this for Christmas too. AlsoI have a box for Christmas cards–works great! 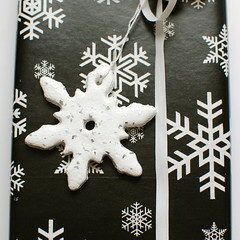 I must make these-I adore snowflakes, and these seem very doable. And I’ve got to say, I LOVE your wrapping paper! It’s gorgeous! (Last time I commented I forgot to get rid of the “name” bit lol. I like well made hand made ornaments as well. That is a lovely idea. I lost it last night and didn’t accomplish anything other than some knitting and the requisite easy weeknight meal. I probably should have smushed my clay around. It would have made me feel awesome! Love that! 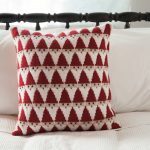 It’s a great idea to get started on Christmas now. I always wait to the last minute and then rush the packaging. Not cute! lol Your snowflakes are beyond adorable. These are gorgeous. 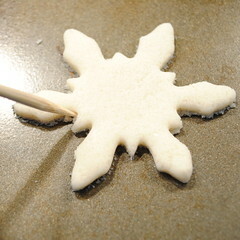 My son and I made two batches of salt dough ornaments last week to use as tie-ons for all our gifts this year; they turned out really cute, but how did you get yours to stay so nice and flat? Mine got all puffed up!